The Enviroment Page in the Target Definition Editor is used to edit many settings in the definition affecting how the target will be compiled and run. The Environment section has four settings that describe the system that this target is built for. If left blank, the settings for your current running environment are used. Changing these settings will affect how Software Site Locations resolve as well as how plug-ins are built and exported. 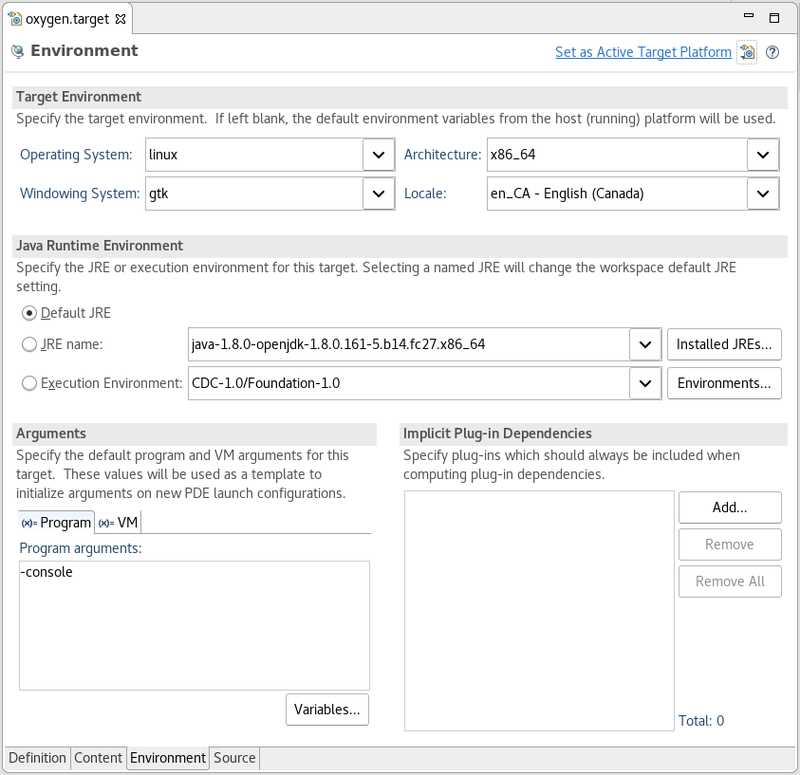 You can specify a JRE or execution environment for this target definition in the Target JRE section. If you specify a specific JRE or EE here, when this target is set as the active target platform, your workspace default JRE will be changed. The Arguments section is used to set the default program and vm arguments for new PDE launch configurations.Pressing Variables will open the Variable Selection Wizard. You can browse through all known variables and get descriptions of what each does. Under the VM tab you can also press Import. This will open the Import Arguments Dialog. You can use it to import vm arguments used in the configuration data of any installation locations specified on the definition page. The Implicit Dependencies section is used to manage the implicit dependencies of the target. Any plug-in marked as an implicit dependency will always be added as a required plug-in when PDE determines requirements. Pressing Add will open the Implicit Dependencies Selection Dialog allowing you to select one or more plug-ins from your target platform to add as implicit dependencies.